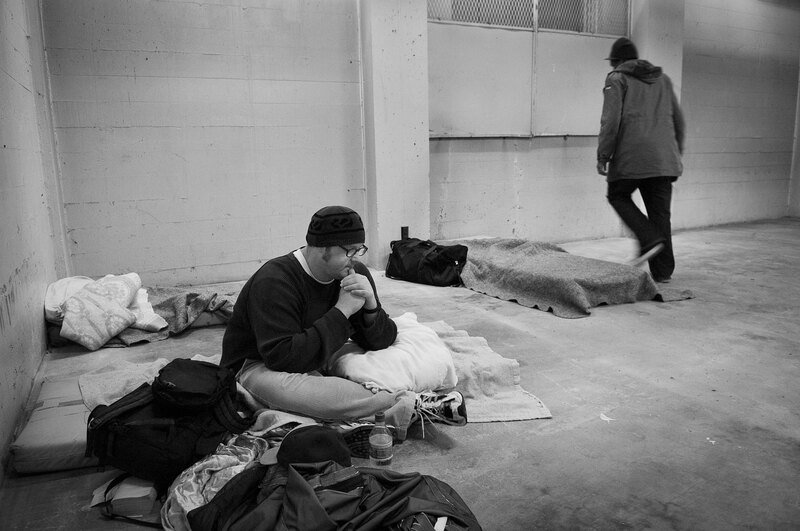 At the surplus former Federal Office Building/Immigration and Naturalization building in Seattle's International District, two homeless men prepare to bed down for the night. SHARE/WHEEL, a cooperative of homeless people runs this and 12 other shelters and is the city's largest provider of emergency housing for Seattle's estimated 12,000 homeless people. This shelter attracts two to three dozen homeless per night. The facility , which was used as a jail for illegal aliens, is spartan but affords a dry and safe environment. Volunteers from among the group manage the facility and provide security.